Live Latin band plays every night from 20:00, and traditional South American dancers perform. La Casa Argentina Steakhouse brings the tastes and ambience of South America to Prague. 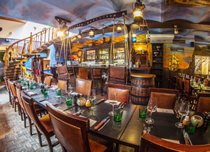 This fun, entertaining restaurant is located in the heart of the Old Town. La Casa Argentina has several rooms. Each represents a different aspect of Argentina. One is a nautical tavern with lanterns and swinging chairs. Another is the Iguazu Salon, which represents the Parana River. One room even has a parrot, an iguana and tropical fish. And the Caminito Salon is where the live band performs. As with any Argentinean restaurant, the mainstay of the menu is delicious grilled meats, cooked al asador (over a fire) or a la parrilla (on a charcoal grill), with chimichurri sauce and grilled vegetables. Steaks are succulent and the sizes range from regular to huge! Choose from beef tenderloin, strip loin, rib eye steak, filet mignon, pork ribs and lamb saddle. There is also fresh fish and seafood - red mullet with shrimps, tuna fillet, salmon, tiger prawns and scallops - plus pasta dishes and salads. Main meals are complemented by some good starters, an array of side dishes and sauces, and home-made deserts. The wine list at La Casa Argentina comprises South American wines stretching from Argentina to Brazil, alongside old world favourites from France and Spain. Not forgetting the delicious, freshly prepared cocktails. Overseeing the kitchen is head chef Filip Sulc who has a rich experience gained from abroad, where he worked at several Michelin star restaurants. Live Latin bands play every night, accompanied often by traditional South American dancers. La Casa Argentina is a fine choice for all manner of groups, from corporate diners to stag and hen parties - rooms can be sectioned off or made private to accommodate most requests. The food is terrific, particularly the steaks and fresh fish, and there is a lively buzz about the place. Advance reservations are essential.